Today is my fiancé's 28th birthday, and to celebrate it I've planned out a day of delicious nosh and to top it all off, I decided to make this cake, as he loves caramel and bananas. The original recipe had caramel frosting on the top of the cake, but it appeared to be too sweet, so I decided on ganache instead of frosting. I may have mentioned this earlier, but for a pastry chef, I really don't like sweets all that much, so whenever caramel is spoken or shown, I shudder, and my lips curl in disgust. Ironic? Perhaps, but nonetheless, it doesn't stop me from making sure that my partner has the best birthday possible. I got a 220g bag of treat-sized Mars Bars instead of individual bars, as they worked out to be cheaper, and I could decorate the top of the cake with the remaining bars. 1. Preheat the oven at 180°C, and grease and line a 20 x 20cm square cake tin with baking paper. 2. In a bowl or a stand mixer, cream butter and brown sugar until pale and creamy. Scrape down the sides and then add the bananas until just combined. Add the eggs one at a time, beating after each egg. 3. Add the milk and combine until smooth. Add the flour and stir through with a spatula first, because beating for a minute or two, until smooth and creamy. Fold through the chopped Mars Bars, and then spoon the mixture into the tin. 4.Put the tin in the oven and bake for 50-55 minutes, or until a skewer comes out clean. Turn the cake halfway around once during cooking to ensure even baking (I'm always dealing with crappy ovens at all of my rentals, so I always turn the food around at least once). 5. Remove the cake from the oven and let cool on a rack before turning out from the tin. Make the ganache. 1. In a small saucepan, heat the cream on medium-low heat until the cream starts bubbling. Turn the heat to low, and add the Mars Bars pieces and chocolate, stirring with a whisk to combine until melted. It's okay if there are little lumps of Mars Bar filling. Remove from heat. 2. Pour the ganache into a bowl, and set aside. 1. Trim the top of the cake so that it's more or less flat, then cut in half lengthwise so you have two rectangular pieces. Trim the sides if necessary. 2. Place one of the rectangles on a plate/board, and drizzle some warm ganache over the top. Sandwich the second rectangle on top of the other, bottom side up. Put the cake in the fridge for an hour to let the ganache set. 3. With the remaining ganache, cover with cling wrap so that it is touching the surface, and press the air out. This prevents sugar crystals from forming on top of the ganache and ruining the creamy texture. Place the bowl in the fridge to let it set to a spreadable texture. 4. When the cake is ready, take both ganache and cake out of the fridge. If the ganache is still a bit too firm, just pop it in the microwave for 20-30 seconds, and stir. 5. 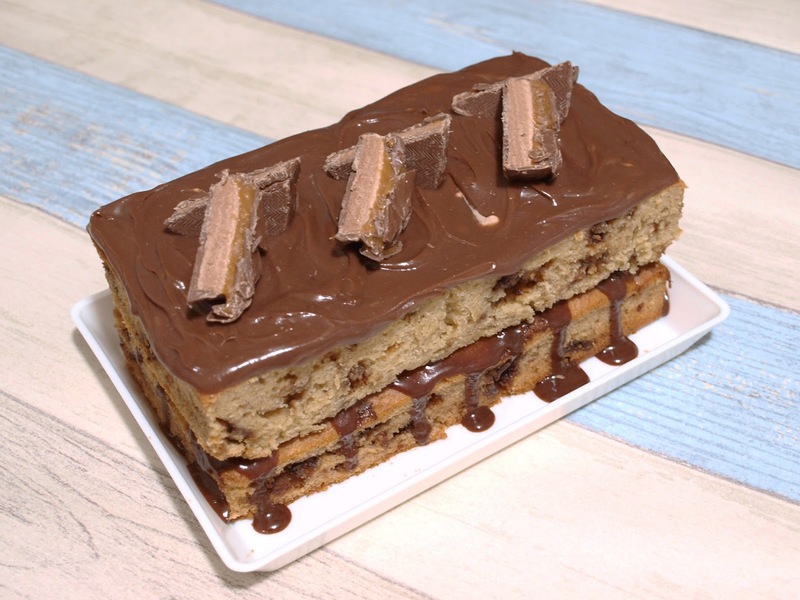 Frost the top of the cake with the ganache, and decorate with Mars Bars halved diagonally. Return to fridge and serve when required. Oh my goodness, this looks delish! 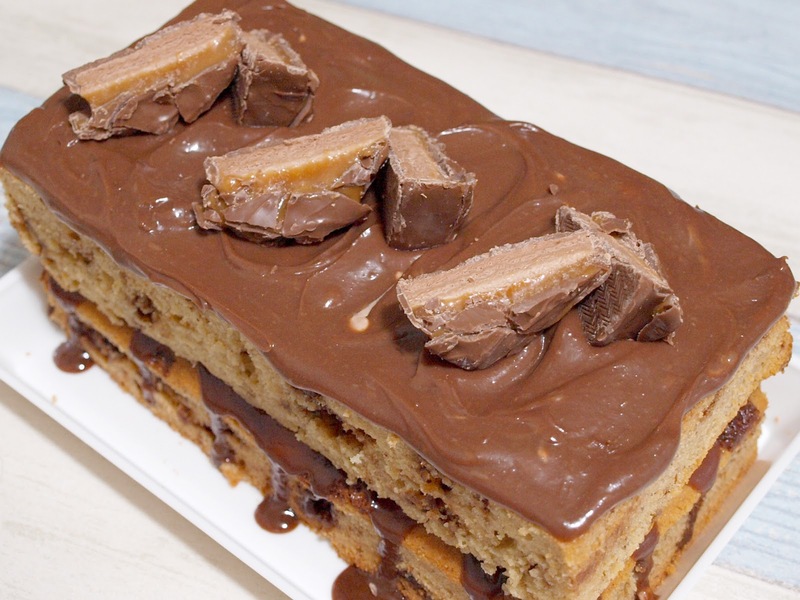 I'm useless at baking, I'd probably just end up purchasing the Mars bars and eating them on their own haha! OH MY GOSH I need to eat this ASAP! This looks absolutely divine! I hope your fiance had a lovely birthday, I'm sure he did with your amazing baking skills. I have the world sweetest tooth it's ridiculous, I thought it'd go when I 'grew up' but clearly not! Make it! He said he had a good day, so I'll take that as a plus. He's still got heaps of cake in the fridge. Try working in a cake factory, soon you'll start hating sugary foods with a passion. I used to have a major sweet tooth back in the day.